I am not sure what to do any more. I bought the car knowing it had a driver side power window issue. And after reading a few posts, and talking to tech at Pelican I didn't see this as a reason not to buy the car.... I am starting to think this was a mistake. So here is what it does. Please note the PASSENGER side window works perfect! Just like it should. Release the top, it inches down, it does EVERYTHING it should. Now the driver's window.... I am not sure what the hell it is thinking. Some times it will operate smoothly, just like it should. Other times, you go to roll the window down and goes down in like 2" increments. You have to keep pushing the button to make it go down. When it does this, it is the same process to roll it up. 2" increments until you get to the top of the door. Ok so now the window is at the top, the next part is a gamble. You go to open the door and SOMETIMES the window will drop, but when you close the door it does not go back up. As a matter of fact, if you keep opening the door the window will inch it's way down not going up. Now the flip side, is some times it won't even go down when you roll it all the way up. Oh and I have also had it roll down halfway while opening the door. When it does that the window will NOT go back up! It's a fight, you roll it up, it goes down, you roll it up again, it goes back down, you threaten to burn the car to the ground and collect the insurance... it stays up. Please note that while all this is happening the passenger side window is behaving just fine! I bought a new Genuine window regulator, and a new driver side door switch. I installed both of them following the tech article. When I was done, the window worked like it should. I was happy and proud of my achievement. I swapped the passenger power window switch with the driver side.... Things seemed good! It was working normal!..... Played with it like 4 times! I thought I had success! Run upstairs.... run back down to the car, because I forgot my glasses.... AND THE EFFING WINDOW IS ACTING UP AGAIN!. I know tomorrow morning the window is going to give me hell again. Please advise! I don't know what to do any more! Remember the passenger side window behaves just fine! Immobilizer fault (possibly water damage). Wondering if you damaged the wiring when working on the center console so things are shorting out or there's a break in continuity. +1... have you tried to operate the window with the key? If it doesn’t function properly with the key modes, then it could be the door lock micro switch doing weird things. Either way, check your immobilizer. PW is the man for all things electrical! Second if not.... Any one use ECU Doctors? Also known as Specialized ECU Repair out of Florida? ECU Doctors are VERY expensive. Contact Steve (member "Qmulus") on this forum. He did super work on my very toasted immobilizer board for a very reasonable fee. Some part of me wanted me to open it, and see it full of water, some kind of visible damage, but to no avail. Guess I will need to send it off and have it tested to see if it is the problem. There are only a handful of components involved in the operation of the window. Primarily the regulator, switch, relays (located on and controlled by the immobilizer) and the wiring between these things. Since you've replaced the regulator and swapped switches, that leaves the immobilizer and wiring. As Thom said, check your wiring before committing to an expensive immobilizer fix. 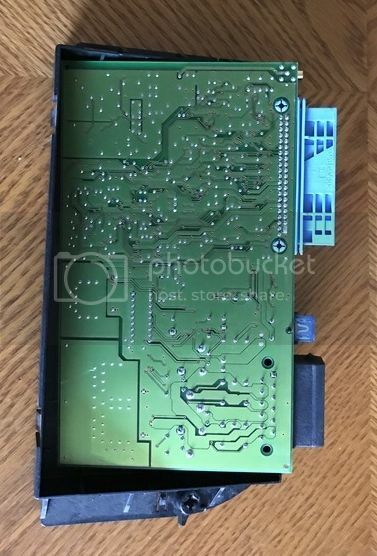 It would be worth while to look at and possibly clean the door harness connector (inside the door jamb) and the immobilizer harness connector. If the immobilizer shows signs of water damage, you could try a gentle cleaning with isopropyl alcohol and a soft brush, but once they have visible corrosion, they usually require professional repair. Last edited by particlewave; 11-12-2018 at 03:09 PM. My guess is that there is a relay problem in the alarm/immo module, but this exact failure is not common. I would check to see if there was any apparent water intrusion in the alarm/immo module, but honestly if there is cleaning is likely not going to do much good. In my experience, most of the corrosion and damage is under the relays and you cannot get at it unless you remove them. 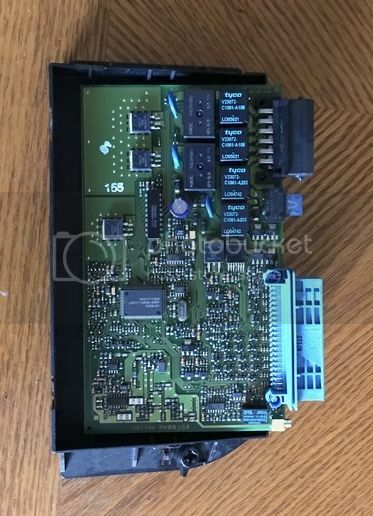 Unless you have a lot of experience with that kind of work, I would not attempt to remove them, especially if there is a lot of corrosion as it is very easy to damage the relays and PCB needlessly. Usually the relays can all be salvaged, and the PCB repaired even with fairly extensive corrosion damage. That said, waiting for things to stop working before doing anything about it increases the likelihood that the module is not economically repairable. Ok so I am not sure what to do anymore. I have now replaced EVERYTHING in the driver's side door. Regulator, micro switch on door handle, and the door latch. I have removed the the plug between the body and the car. There is no corrosion, it is nice and clean. I am now left with three options. 3) sell the car and never look back. Oh the other day for a brief moment.... everything worked like it was supposed to! It has picked up a new issue also. 4) about a minute later the DAMN WINDOW ROLLS DOWN ON ITS OWN! Still sounds like classic faulty immobilizer. You might contact Qmulus and see if he'll take a look at it for you. So I have sent my Immobilzer to Qmulus. Great guy to deal with, but sadly there was nothing wrong with my immobilzer. He even installed in his Boxster and it worked flawlessly. We got talking via email, and I also checked the wiring diagram. The window drop function seems to be internal to the door. I have replaced just about everything in the door. Two items are left..... The door harness, or the power window motor. I have thought about buying a door from a wrecking yard.... It would be cheaper than a new power window motor from Porsche. Bingo! $70 shipped with only 20k miles on the donor car. Oh and he takes returns, you just have to pay for the shipping back. So if it doesn't fix your issue, just send it back to him. Last edited by KRAM36; 04-15-2019 at 05:02 PM. Check with Woody on the window motor. I am sure that he can help you out. Per Woody's last post on the forums on 03-14-2019. It might be kind of hard for him to buy this part from Woody.